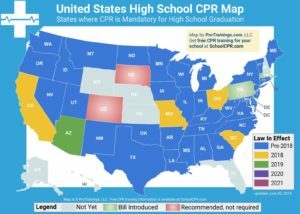 School districts must provide one time cardiopulmonary resuscitation (CPR) and automatic external defibrillator (AED) instruction as part of the health curriculum. CPR training must be from a nationally-recognized association with expertise in CPR and AED instruction. 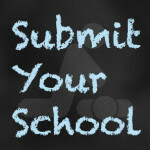 Districts may select no-cost, non-certification instructional program to meet this requirement. “Notwithstanding the provisions of any law, rule, or regulation to the contrary, the board of education of a public school district that includes grades 9 through 12, or the board of trustees of a charter school that includes grades 9 through 12, shall provide instruction in cardiopulmonary resuscitation and the use of an automated external defibrillator1to each student prior to graduation1 as part of the district’s implementation of the Core Curriculum Content Standards in Comprehensive Health and Physical Education1. The board of education, or board of trustees, may select a no-cost, non-certification instructional program to meet this requirement. The provisions of subsection a. of this section shall first be effective with the 2014-2015 grade nine class The instruction provided pursuant to section 1 of this act shall be modeled from an instructional program established by the American Heart Association, American Red Cross, or other nationally-recognized association with expertise in instruction in cardiopulmonary resuscitation and the use of an automated external defibrillator; and include a hands-on learning component for each participating student.